Over the years, research has shown that health and wealth often go hand in hand. A report1 from the Urban Institute, found that health rises in step with income. 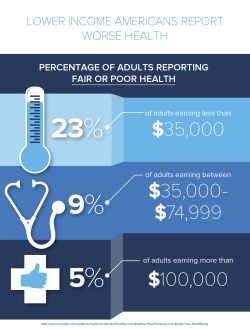 While 22.8 percent of adults earning less than $35,000 a year reported being in fair or poor health, just 9.4 percent of adults earning $50,000 to $74,999 a year say the same. Among those earning $100,000 or more, just 5.6 percent reported health troubles. Wealthier households tend to have greater access to health insurance, medications, and nutritious foods, which can account for much of the disparity. However, money-related stress can also be the cause of many health problems. According to an Associated Press-AOL Health poll2, Americans with debt report more stress and suffer health problems like back pain, migraines, ulcers, and heart problems. Nearly a quarter (23 percent) of people with high levels of debt-related stress say they have suffered from severe depression versus 4 percent of people with low levels of debt stress. Create a plan. Research3 has found that people with a propensity to plan tend to be both healthier and wealthier. For example, a one-point increase in propensity to plan (on a six-point scale) was associated with a 15.3-point increase in a person’s credit score. Planners were also found to do better with weight management and had more success with dieting. Essentially, if a respondent reported a high propensity for planning, the more likely he or she is to engage in positive health behaviors—like eating a nutritious breakfast every morning—and financial activities, like avoiding risky investments. All this data suggests that taking the time to create a plan—making a budget, determining a retirement savings strategy—greatly increases your chances for financial success, both now and in retirement. Adopt better habits. As with physical health, financial health is often achieved by breaking old negative habits and forming new, better ones. Like swapping fries for a salad, positive habits add up over time and create more sustainable, long-term lifestyles. A recent study4 found that several financial habits were common among respondents who felt the healthiest and the most financially secure, including paying off their credit cards every month, spending within a budget, and working with a financial professional. Make it easy. Sudden and dramatic change—whether cutting out carbs or curbing all discretionary spending—can be difficult for many people to stick with. Instead, focus on baby steps and look for ways to make change easier. Setting up automatic transfers to your retirement savings account, for example, takes the work out of putting the money aside. Just like with health matters, such as weight loss or injury recovery, you won’t see changes to your financial well-being overnight. Instead, improvement will be gradual, even slow. Yet, small and consistent positive financial behaviors, over the long term, can—and will—make a big difference. 1 Woolf, Steven H. How Are Income and Wealth Linked to Health and Longevity? (n.d.): n. pag. Urban Institute, Apr. 2015. Web. 2 "Debt Stress: The Toll Owing Money Takes on the Body." The Associated Press - AOL Health Poll. The Associated Press, 2008. Web. 3 O’Neill, Barbara, Ph.D., CFP®, AFC, CHC, CFED, Jing Jian Xiao, Ph.D., and Karen M. Ensle, Ed.D., RD. "Journal Propensity to Plan: A Key to Health and Wealth?" Journal Propensity to Plan: A Key to Health and Wealth? Journal of Financial Planning, Mar. 2016. Web. 4 "The Seven Financial Habits Study | Northwestern Mutual." Financial Research | The Seven Financial Habits Study | Northwestern Mutual. Northwestern Mutual, Jan. 2008. Web.